At Louisiana Truck Outfitters,we are here to make it as easy as possible. 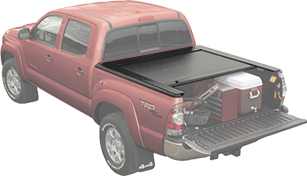 To start off with the basics: What is a Tonneau Cover? 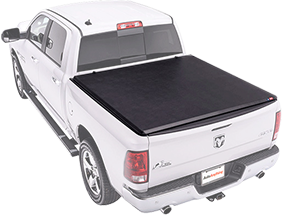 A Tonneau Cover, also known as Truck Bed Cover, is simply a cover for the bed of your truck that allows for safe storage for your belongings and a stylish addition to any truck. 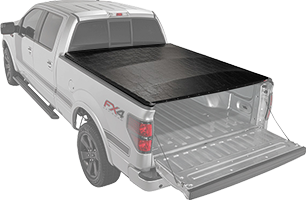 Hard truck bed covers offer the most protection. They're usually constructed of a thick fiberglass with an aluminum frame or separate panels which are also made of aluminum. Most hard covers include a lock to protect your valuables. If the cover doesn't have a lock then most of the time a tailgate handle that locks will provide the security needed. Styles include that of painted tonneau covers, folding tonneau covers, or retractable tonneau covers. We offer a variety of brands and price points. Soft truck bed covers are popular t because they offer style and function at a lower price than any other type of cover available. They don't offer the security of hard tonneau covers because of the vinyl used to cover the bed. The benefit is paying only about half the price depending on which cover you choose. Folding truck bed covers are unique because they can be made with either hard or soft materials. Its function relies on hinges that allow multiple panels to fold onto each other for incremental bed access. The original covers were tri-fold with 3 panels but different brands manufacture covers with 4 panels as well. 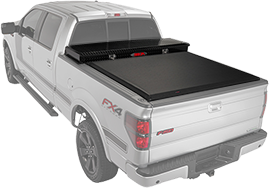 Soft folding tonneau covers are more affordable than hard folding tonneau covers and offer the same versatility but less security. Pay attention to features because some covers allow folding from the front of the bed and use different types of hinges for more durability. 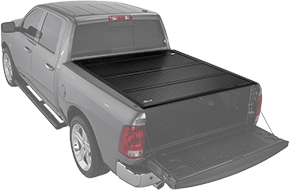 Retractable truck bed covers are the most user friendly cover for a number of reasons. These covers consist of aluminum slats that roll up into a spring loaded canister at the front of the bed. Although the canister takes up some space in the bed, retractable covers offer virtually full bed access. The hard aluminum slats make for a very strong top panel and include a lock on the back of the cover for easy locking and unlocking. Fully automatic covers are available in the retractable style. Before the Toolbox truck bed cover was available, you either had to choose between a toolbox and a cover. For most workers, this meant sacrificing the tonneau cover. These covers come in a soft roll up, snap, or hinged style allowing for more options. Standard sized 20"-21" toolbox are accommodated for and some covers can handle bigger toolboxes with some modification.